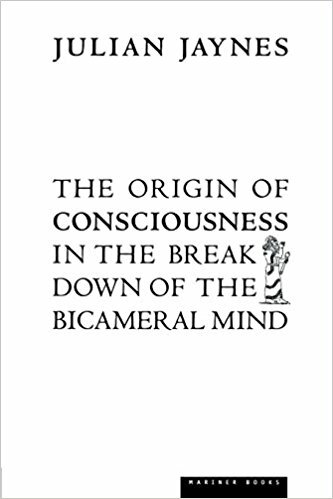 Having read two-thirds of The Origin of Consciousness in the Breakdown of the Bicameral Mind, by Julian Jaynes, Ph.D., I am comfortable in discussing the ideas proposed in this groundbreaking, extraordinarily exciting treatise prior to finishing the book. Dr. Jaynes lays out his theories and conclusions from the very start, working backwards by examining detailed supporting evidence, which he offers as proof of his hypotheses. The Origin has evoked a wide spectrum of reactions since its publication in 1976, labeled by some critics as nothing more than an outlandish set of propositions, while others embraced it as a revolutionary and unique perspective on how the mind developed in the ancient world. Dr. Jaynes’ presentation of such a large-scale and all-encompassing overview on the subject of the history of mankind’s inner thinking can’t possibly hit the bullseye. Yet in The Origin he proposes with confidence and endearing, affable humility that he has discovered how human neurological development worked in tandem with historical, religious, cultural, economic, and social events mostly over the last three thousand years he discusses how this ultimately leads to the unique, individual, and highly structured voice we maintain today: our inner consciousness. Although this book is at times scattershot, it must be recognized at least as a great start to further engage in a more complete, nuanced, and timely follow-up. Dr. Jaynes’ theory centers around details of the biology of the brain and interpretation of the vast ancient historical record, and he readily notes that such an enormous theory of everything needs more work and study. Dr. Jaynes concedes that many of his ideas are speculative, but he does not waver from his belief in its basic foundation. One may criticize, for example, his dependence on selective writings, artifacts, and remains from the ancient period for use in generalizing what motivated the behavior and interior observations of all people thousands of years ago. 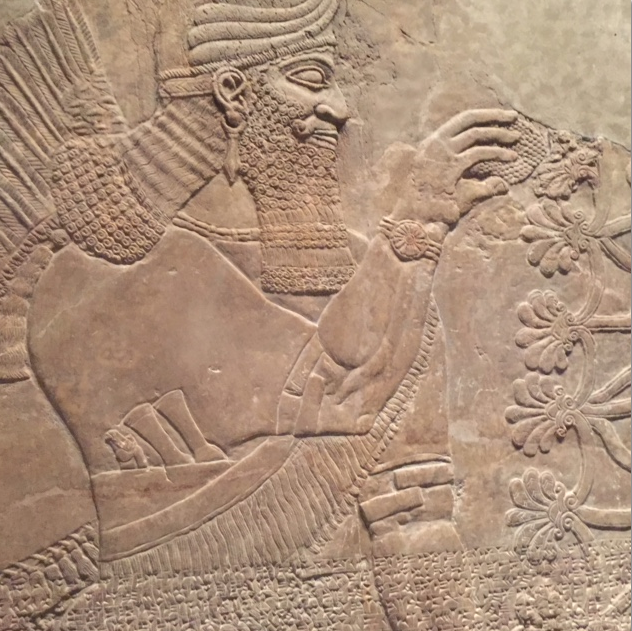 When looking at the statues, buildings, imprints of seals, ivories, and so on from ancient Middle East, we can’t help but make assumptions about the past based on our contemporary atmosphere. Yet it is apparent, as Dr. Jaynes notes, that in the regions covered by the book the expressions and features of kings, gods, attendants, and others are coldhearted and emotionally distant.. Eventually, there’s a slow progression, culminating with the ancient Greeks at about 700 B.C, as the images morph into representations graced with loving beauty, heroic postures, grand gestures, and an appreciation, bordering on ecstatic at times, on notions of both body and soul. Dr. Jaynes details the Greek reaction to the horrific misery of the “Dark Ages” which were initiated in about 1200 B.C. and lasted several centuries, set in motion the timeline that will eventually resolve into the way we speak to ourselves in our heads to day. The proposed “bicameral mind”, presented in The Origin can’t be observed or proved to actually exist, yet the theory is beautifully described with personal passion by Dr. Jaynes. He believes that the left and right portions of the brain were divided in the way they processed the external world surrounding ancient mankind, with one half fooled by the other to believe that hallucinated voices originated from sources that could be deemed as commands by the gods. These voices, heard only by some, arose as spoken language along with the development of the written word. 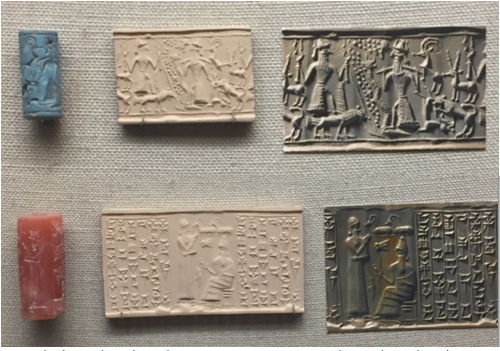 Those with the strongest connection to what they believed was the forceful directing of society by these vocalizations took on the roles of king, priest, or intermediary with the gods. Dr. Jaynes proposes this system developed regionally and with individual characteristics throughout the area under study. The so-called “breakdown” of the bicameral mind occurred slowly over centuries, after populations grew, war became unexpectedly common, and trade led to increased contact between varying tribes and societies. These changes introduced incompatible rival gods and customs in the region leading to confusion of the voices, akin to the described mayhem in the biblical story of the Tower of Babel. Dr. Jaynes also describes several natural crises that put the normalized system of the period into panic. By the start of the first millennium, Homer’s work had been passed down for generations and finally canonized in The Iliad, and Dr. Jaynes unveils the tense struggle within the general population, as the hallucinated commanding voices needed to be replaced for survival’s sake by an emerging personal, inner dialogue. Jaynes’ discussion and analysis of these changes motivating the non-evolutionary, yet biological shift, reads as the most historically and scientifically sound section of the book. Ancient mankind perceived the world through external instinctual sensation, which Dr. Jaynes’ believes was dominated and ordered by invisible vocalizations. After 1000 B.C., the world had to adapt to changes on many levels making internal decision-making processes take over based on reactions to visual stimuli. The world moves from the shackles of auditory constraints towards the eye’s window to the soul. I have to admit that I do not completely believe Dr. Jaynes’ idea that the minds of those living in the ancient civilizations under study lived and died by the commands and rules laid out by hallucinated voices of the so-called gods and divinities. The tenuous biological support of the wider theory, which relies on studies that discussed observations of patients today with neurological conditions and symptoms mirroring what he believes were the hallucinated and god-like voices in the heads of the ancients (e.g., schizophrenia). Perhaps the works of the Pre-Socratics and others who put aside the conception of the gods as creators of the physical world and the actions of men can be read as the evidence of the final labor push of the birth of the inner individual. 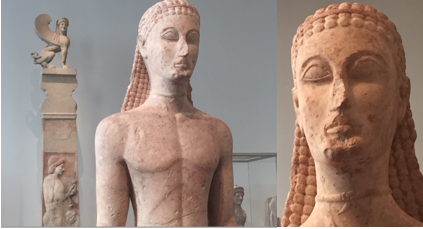 Standing in front of the famous Kouros sculpture from ancient Greece the other day at the Metropolitan Museum of Art, I meditated on its mysterious face in light of the theories of Dr. Jaynes. The sculpted youth appears ready to wake up, was along with the whole world, to freedom granted by new consciousness. You can almost hear the voice of reason speak for the first time. This entry was posted in Book Reviews, Culture Corner, Current Articles by Sarah Baker. Bookmark the permalink.